I have this great story outline that I thought COMPUTE! might like to follow up. It's just that I don't know if you publish fiction submissions. It's this heartwarming story about a fellow called Scrooge Tramiel, who runs a pet shop in old London, or California, or Philadelphia or somewhere (funny, the location seems to shift every time I think of it). 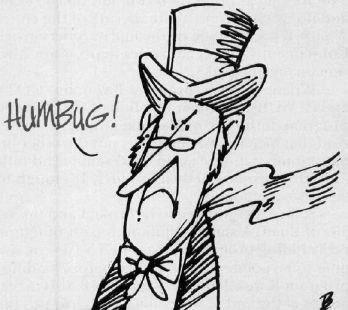 Anyway, he exhorts his lowly clerk, a fellow by the name of Cratchit Finke, to work through the holidays on a new computer system to be called the Humbug III, and leaves to go home. Well, what should happen but this guy runs across the ghost of his former partner, Jacob Peddle, who rattles chains and chips and emits fearful moans in all directions. The upshot of this visitation is that Scrooge is going to be visited by three more spectres: the barrister of Christmas past, the solicitor of Christmas present, and the lawyer of Christmas future. Faster than you can say, "restraining order", the Christmas past fellow pops up and reminds Scrooge of how helpful he used to be to others. "Spirit, why do you torture me so?" wails Scrooge. "Yes, I gave that young fellow a chip to play with … and he promptly founded Apple Computers with it. Indeed, Radio Shack got its start in the time period between when I announced my computer and started delivering it." Just then, the digital clock beeps and along comes Christmas present. Not a Christmas present, you understand; just the Ghost of a Christmas present, who shows retailers warming themselves over the glow of their CRT screens. "Everybody else's model three has failed," they seem to be saying, "will Scrooge come through for us?" An announcement of the digital cuckoo clock heralds visitor number three, the spirit of Christmas future. The screen swirls uncertainly … coughing and gasping, Scrooge peers through the orange smoke … is that IBM gaining credibility? What's going on here? The Spirit intones, "I see unused joysticks by the fireplace…" But begging and pleading and threats of countersuits reveal that it ain't necessarily so … there's still time to reform. Dawn is breaking. Maybe the light is dawning, too, for Scrooge rushes over to the window and shouts at a passing boy, "Bring me the biggest goose you can find! My competitors have all the turkeys!" And the story ends with a traditional Christmas scene … as Tiny Tim says, "God help us, every one!". Whaddya say, Mr. Lock? Do you think you can use the story?